I was working a shift at my on-campus office job when I received a screenshot of the tweet via text message from a friend. I read the words again. And again. And then a fourth time. I froze. It was a situation I’d imagined countless times, one that flits through my mind almost every time I walk into a public space with large crowds of people. The thought was even more prevalent in the immediate aftermath of the mass shooting at Borderline Bar & Grill in Thousand Oaks just two nights prior and only 40 miles north of LMU. As sirens blared outside, I shut the office door, drew the blinds, and proceeded to hide in a supply closet, clutching my phone as I awaited updates. Loyola Marymount has an emergency notification system precisely for situations like this one. Called LMU Alert, the system allows the university to relay urgent information to students by text, email, and phone call. I get alerts maybe once a month, typically for drills or the occasional off-campus threat. The last one I received was in October, notifying me of an earthquake drill. On Friday, LMU’s Alert system didn’t perform the way it was intended to. As I hid in the closet, friends and family continued to keep me updated by texting screenshots of tweets. At 6:08 p.m., the Los Angeles Police Department’s Twitter account responded to the initial PDR scanner tweet: “LAPD Officers are on scene and conducting a systematic search, but at this time, there is NO evidence of an active shooter or any victims.” Rumors started trickling in that a student had yelled about an active shooter as a joke, and another student overheard and alerted his mother, who called the police. Around 6:30 p.m., the all-clear was called. At 6:34 p.m., LAPD tweeted: “We have finished clearing the Loyola Marymount Campus and found NO evidence of any shooting.” It was a false alarm. I left the closet. LMU’s emergency notification system has been in use for over a decade, and this wasn’t the first time that it failed to communicate pertinent safety info to students. In 2008, shots were fired at a local high school student within three blocks of the campus’ back gate, and the sudden LAPD presence resulted in similar concern and confusion among the student body. The school didn’t issue an alert until over two hours after the shots were fired, according to LMU’s student-run newspaper. In 2011, the system issued a false alarm. Three alerts were sent to students over the span of 15 minutes: the first warned of an individual with a firearm on campus; the second message addressed the first, calling it an error; and the third informed students that the campus’ Department of Public Safety had received a threatening email. It was later clarified by the LAPD that the first message was issued by mistake, while the last message was correct. Students were understandably confused by the contradictory dispatches. Other universities in the Los Angeles area have systems similar to Loyola Marymount’s. USC’s is called TrojansAlert, and UCLA’s is aptly named BruinAlert. It was through the latter that UCLA students were notified of the nearby danger during a June 2016 on-campus shooting. After gunshots rang out, the result of a murder-suicide in which a beloved professor was killed, text messages and emails were swiftly issued to UCLA students letting them know that the campus was on lockdown, and, roughly two hours later, let them know that the order was lifted. “We’re pleased in the way notification went out,” UCLA’s executive vice chancellor and provost Scott Waugh told CNN later. 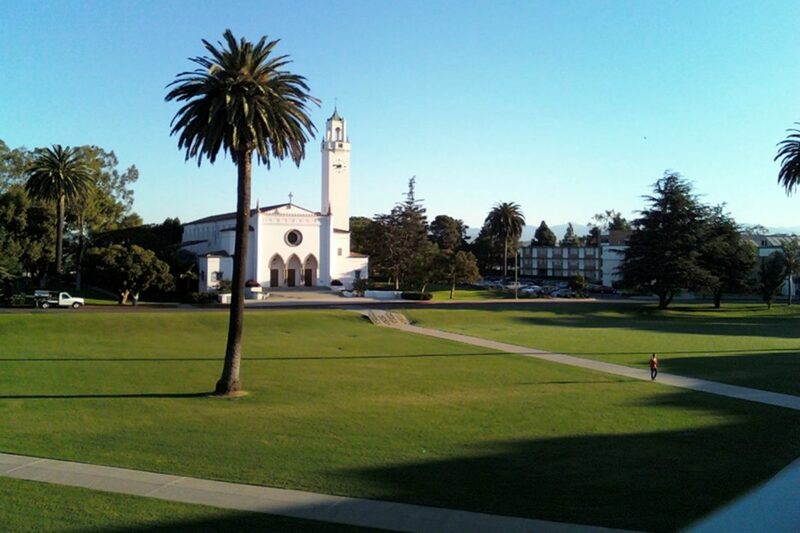 On social media, LMU students were critical of the school’s belated response. “For the people in charge of our safety as students on campus, that kind of negligence is grossly incompetent,” one student wrote on his Facebook page. “LMU[,] do better at informing your students,” another posted. Parents were equally upset. “Why hasn’t LMU sent emergency text to students/parents?” a mother of a student Tweeted to the Playa del Rey Scanner account in the midst of the panic. Our son was walking out of Del Ray North when swat team said there was report of active shooter in Del Ray North – "run". Why hasn't LMU sent emergency text to students/parents??? Since Friday, the university has established an Emergency Communications Action Plan Website to provide updates on the “corrective steps the university has implemented to address emergency protocols.” A town hall meeting is being held on campus on Thursday morning to address the concerns of the public. A test of the LMU Alert system will be conducted on Friday morning, and LMU has asked its community to update their contact information to ensure alerts are received in case of an emergency. Next articleWill Any of 2018’s New Christmas Albums Haunt Your Holidays for Years to Come?